We are located in the Finger Lakes Region of Central New York. The town is best known for its Covered Bridge, built in 1853. 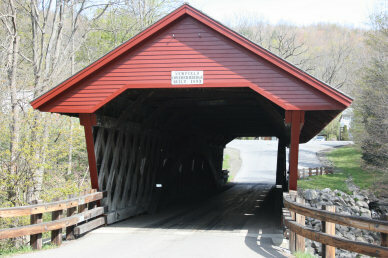 It is the oldest Covered Bridge still in daily use in New York State. Please use the menu items across the top to navigate through this site. Hover over the menu item to see a drop-down list of subjects. On a mobile (touch) device, use a long press on the menu to bring up the drop-down list. Look for the community calendar on the right side of this page. See below for recent news items. The Newfield Town Board will hold its regular monthly Town Board Meeting on Thursday April 25, 2019 at 7:00PM. The Planning Board will be meeting with the Town Board for a portion of the meeting…. Blakeslee Hill Road will be closed Monday April 22 thru Friday April 26, 2019 to through traffic due to road repair and paving. The Regular Scheduled Meeting of the Newfield Planning Board will be on Wednesday May 1, 2019 at 7:00PM. The Meeting will be held at the Newfield Town Hall, 166 Main St.